The following post takes a more in-depth look at three different revenue sources for Oregon that are not discussed as often: liquor, tobacco and lottery. As mentioned at both the forecast release and in the document, these revenues do have general or lottery fund implications. One important aspect is that these revenues are impacted by tax and regulatory policies and their influence on consumer purchases. In particular, a border tax effect can arise when two neighboring jurisdictions have differences in their tax laws. Such discrepancies can affect if, when and where a consumer chooses to purchase a good or service. Overall, the border tax effect is a subject well researched in the academic world (including yours truly.) Currently, the tax differential between Oregon and Washington is impacting consumer behavior, particularly with regard to liquor, tobacco and lottery purchases. The full set of slides available here: NW Border Effect. Following the passage of Initiative 1183 in Washington, the regulatory structure of the state’s liquor industry changed and the distribution of alcohol was privatized, beginning in June 2012. The most noticeable change for consumers is that they can now purchase liquor at many more locations, such as the grocery store or large discount warehouse store, instead of only at the state-run or state-owned stores. Another impact, which was the subject of debate prior to the change, has been an actual increase in prices relative to the previous system. Based on sales data in recent months, the average price per liter of liquor sold at retailers in the state has increased 15% year-over-year. Volumes of sales initially increased following the change, probably as the novelty of buying liquor along with groceries and not needing a separate trip enticed consumers to make the purchase. However this initial surge in sales has subsided in recent months and while the long-run impact on sales is unknown, it does not appear yet to be a substantial, sustained increase. The price increases have also widened a price differential with Washington’s neighboring states. Based on an OLCC survey, the average price of Washington liquor is between 26% (1.75 L bottles) and 33% (750 mL bottles) higher than in Oregon. Please see the slides for more on Washington sales, prices and the OLCC survey. As expected based on the border tax literature,there has been a pronounced impact on sales in Oregon and Idaho, in particular directly along the state borders. 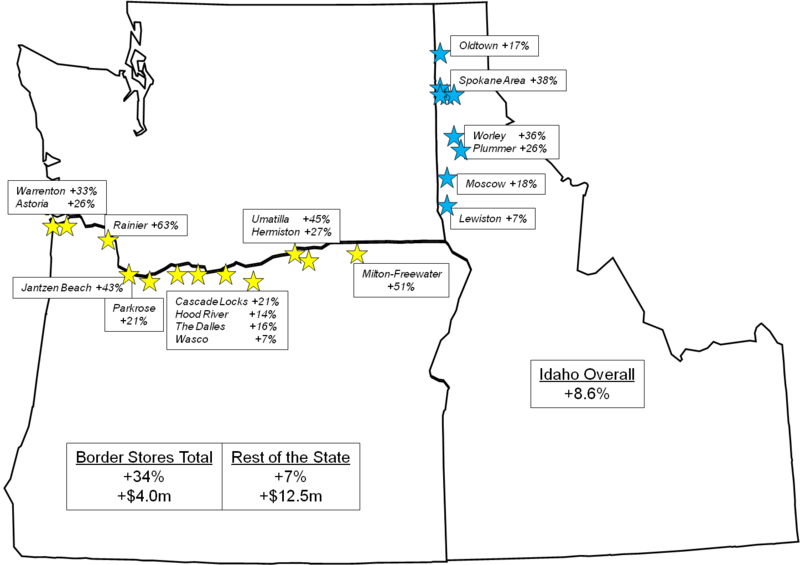 In Oregon over the June – October 2012 period, sales in the 12 state liquor stores along the border with Washington have increased 34% year-over-year while Oregon stores not along the border have seen gains of 7%. In Idaho, overall sales for July – October have increased 8.6% but the border stores have seen gains of 27%. The Rainier store was the subject of a Wall Street Journal article back in September. Based on discussions with both OLCC and Idaho’s Department of Liquor, there are two more important points. First, the impact is being felt in stores further into the states and not just along the border, based on anecdotal evidence and discussion with store owners and operators. For example, Washingtonians on vacation in Idaho’s resort areas or along the Oregon coast also purchase products to take home with them. This impact is effectively the same as it is driven by the price differential (and also product availability and other factors.) 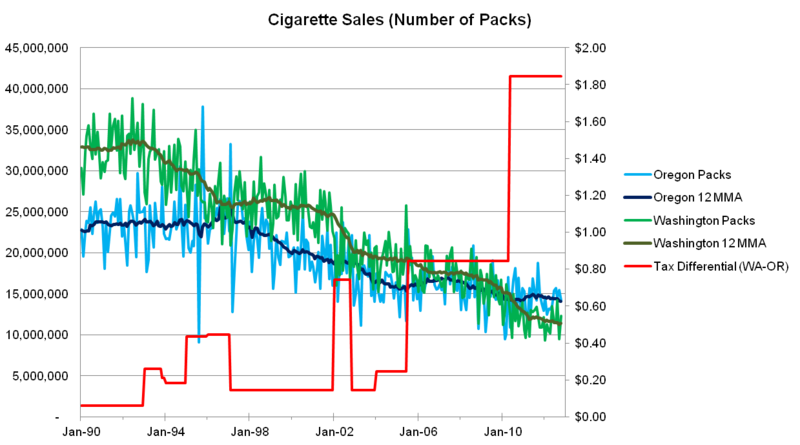 Second, there has been a larger increase in higher end products sold than lower end products. The precise reason is not known but likely is the result of one or two things. Consumers overall may be stepping up their purchases to higher grade (more expensive) products and/or the border tax effect is most pronounced among higher end products, where presumably the price difference would be greater. As consumers in Washington become more familiar with the new regulatory system it will be important to see if the increase in Oregon sales is sustained or if it is merely a product of the transition in tax and regulatory policy. Sales of tobacco products face a similar set of circumstance regarding differences in tax policy. In Washington, the current tax per pack of 20 cigarettes is $3.03 while in Oregon it is $1.18 per pack. The tax rate differential between the two neighboring states does impact sales in each location, along with other factors such as long-run societal trends, tobacco cessation programs, and the like. Generally, cigarette sales have been declining for more than two decades in each state. However, the magnitude of these declines is influenced by tax policy. Typically, when Washington raises cigarette taxes and Oregon does not, sales fall quicker in Washington while they level off or decline less in Oregon. These impacts are mirrored when Oregon raises tax rates and Washington does not. This dynamic can also be seen in our office’s accuracy of tobacco tax revenues, as discussed in this Lund Report article earlier this year. In a stable tax environment, we tend to over-forecast tobacco revenues a little bit but when the tax environment changes, we under-forecast revenues by a larger amount. Over the past decade this is due to the fact that Oregon has not raised cigarette taxes since 2002 but Washington has twice – from $1.43 per pack to $2.03 per pack in 2005 and again to $3.03 per pack in 2010. Should either state change tax rates in the future, the level of sales and accompanying tax revenue will likely be impacted as in the past. 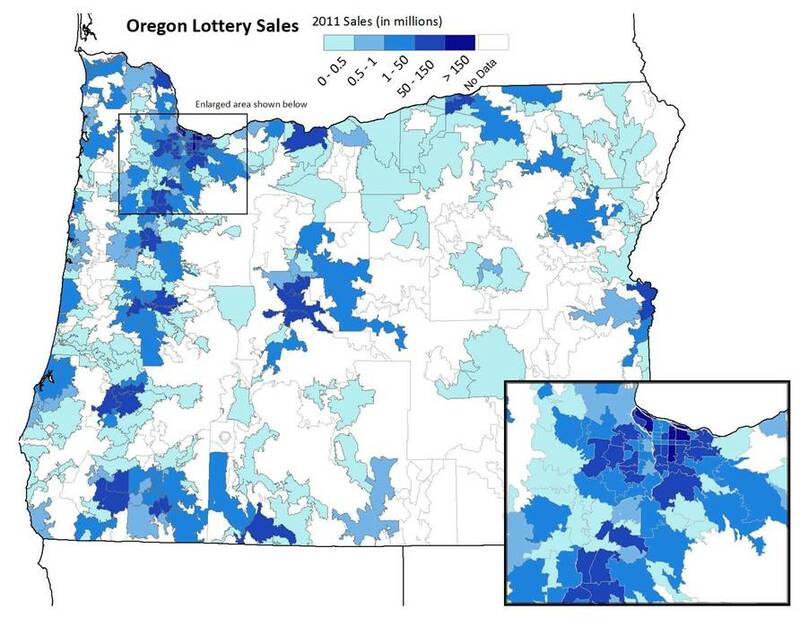 Finally, one more market where cross-border impacts can be seen is lottery, in particular Oregon’s unique and extensive video lottery games. Overall, the total level of sales generally follows the local population (the larger the population the larger the sales.) However, as seen in the map below, sales do appear to be a bit higher in the cities and towns near the border, relative to what their underlying populations would suggest. 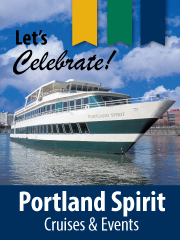 While the first necessary condition for video lottery sales is to have a bar or restaurant that offers the games, the fact that Washington and Idaho do not offer the same set of games and do not have the same, extensive network, effectively makes the Oregon video lottery an attraction. Conclusion: The border tax effect is real and does influence consumer behavior, however it is not the only determinant. As tax and regulatory changes are introduced or proposed, it is important to keep these impacts in mind for not only Oregon’s revenue system but also society more generally. The full set of slides available here: NW Border Effect.